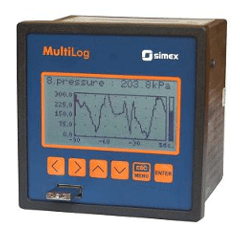 Dataloggers and recorders for measuring industrial processes. The VM7000 is a cost effective high quality paperless recorder from Ohkura. Universal configurable inputs allow it to be connected to virtually any industrial sensor. 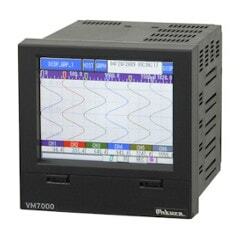 With a standard Ethernet port, the VM7000 recorder can function as a web server allowing the viewing of plant information from any location using nothing more than a web browser. The same Ethernet port can be used for plant communications with Modbus TCP protocol, data file upload via FTP and time synchronisation via SNTP client function. The MultiLog SRD-99 is a 96mm x 96mm panel mount instrument that displays process data numerically and graphically. Data retrieval is conveniently done either via Modbus/RS485 or USB flash drive. Data analysis is done with the free Loggysoft software and allows data from multiple recorders to be assigned to logical groups. Recorder configuration can be done either through the free S-Toolkit software or simply via the recorder keypad. Configuration can be stored on USB flash drive and copied to other SRD-99 recorders. Interface:	serial interface, 3-pin miniature plug. 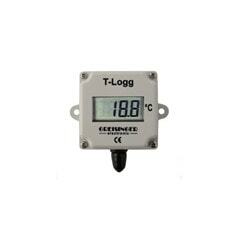 For readout and configuration of the datalogger, the serial converter USB 100 is required. 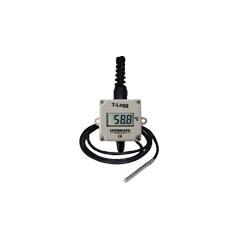 Note: The T-Logg conforms to the standard DIN EN 12830.